What makes a cult actor? One possible answer is a two-worded one: ‘Steve McQueen’. Perhaps the ultimate method is to make a few iconic films, establish a definitive person and to die young…a feat that Steve McQueen sadly managed to achieve. From the modern perspective, cult actors’ images are everywhere, drawing a distinction between an actor such as McQueen and his compatriot Paul Newman- a great performer but with a longevity that transforms his cult status into that of fully-matured Hollywood great. One problem with a cult actor is preserving their status and not letting the stardom be tarnished by a host of less than credible biographies plumbing the depths from a variety of obscure angles. In terms of Steve McQueen, one angle that had not previously been thoroughly explored is his later years, when, according to the flyleaf of his wife, Barbara,’s book, the actor ‘wanted to scale back his visibility’. Now, almost thirty years after his death, in an ironic twist, those final years are more visible than ever. Steve McQueen- The Last Mile is an intriguing yet vast book, its appearance suggesting the panorama of Widescreen that many of its subject’s films were shot in. Its 237 pages lay bare the three and a half year relationship between McQueen and Barbara, whose 400 photographs of the actor illuminate the pages, bringing the legend alive- the personal legend, as opposed to the star of numerous films in the period 1953-80. Perhaps appropriately, the first part of her book focuses on Barbara’s own life, thereby paving the way for her meeting with McQueen on Independence Day 1977 and the burgeoning of their relationship soon after. What is most refreshing about this whole section is its absence of pretension, the anecdotes being warm, witty and fascinating in their ordinariness, told with an air of loving appreciation. The approach is not focused on developing a clear chronology but instead about developing a thematic portrait of McQueen- far more useful in its avoidance of the ground already covered in other biographies. Perhaps it is this thematic coverage that, above all, that makes Steve McQueen- The Last Mile such an entrancing read, for the book’s sheer size might be daunting were it not for its seven true chapters being further sub-divided into bite-sized chunks that deal with particular instances or occurrences. Though the text (and its cavalcade of charming stories) draws the reader in, the other major selling-point for the book is its vast array of Barbara’s own photographs of her former husband, some posed, some candid. These capture the true essence of the man away from the Hollywood glamour machine- McQueen seems relaxed and happy; the photographs having in retrospect an aura of sadness about them for this very reason. One of Barbara’s own favourites appears on page 103, and it shows a man at ease with himself and with his career. Barbara’s pictures document this transformation- focusing in detail on the final 18 months of McQueen’s life and his penultimate film Tom Horn. Although it occurs almost half way through her book, Barbara McQueen’s section on the preparations for Tom Horn is a particularly fine one, and centres around the magnificent photograph that completely fills page 122. This paves the way for Barbara’s almost tangible and poetic account of the intricacies of how she and Steve balanced their relationship whilst still building up to filming. The photograph of McQueen with the dog Junior on page 131 is another fine one- it captures the actor looking less ‘movie-starry’ than ever, but it is none the worse for that. A hundred pages later, and McQueen’s illness is evident- he looks significantly older, even though the photographs were taken only a year or so apart. Ultimately, this is the over-riding sadness in Steve McQueen- The Last Mile, as its subject is captured in middle age but simultaneously at the end of his life, a facet not possible in a book about James Dean, for example. There is also added poignancy in McQueen’s happiness in his final years, the way he “found” himself and the way this laid-back lifestyle was abruptly cut short. In Steve McQueen- The Last Mile, Barbara McQueen has provided a fitting eulogy for her late husband, ‘a true artist whose work has stood the test of time and will continue to do so’ (p.111). Books like this are important, not just to act as a catharsis for their author but to both preserve the legacy of their subject and enhance it. This particular volume succeeds by simply being itself- it is an intimate memoir yet a far-reaching panorama, and, above all, a specialist book with widespread appeal. 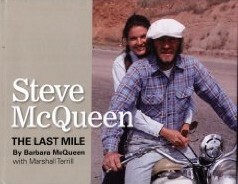 'Steve McQueen- The Last Mile' is published by Dalton Watson Fine Books.